Hair feeling limp? Looking thin and lifeless? Get ready for some massive lift and volume. One of the best teasing combs out there is Teeze W/ Eez. It is hands down, my fave. Check them out. You probably are thinking, who teases their hair anymore?! That’s what I thought. But, imagine soft and lots of body, not a tangle-y rat’s nest from the 80s! I have very fine hair. I try to plump it up with thickening gel or sometimes mousse (which I find to be more drying for some reason). Usually though, hair products alone aren’t enough. I like the look of full and fresh, not so sleek and stick straight. Two in particular combs are my go-to teasers. 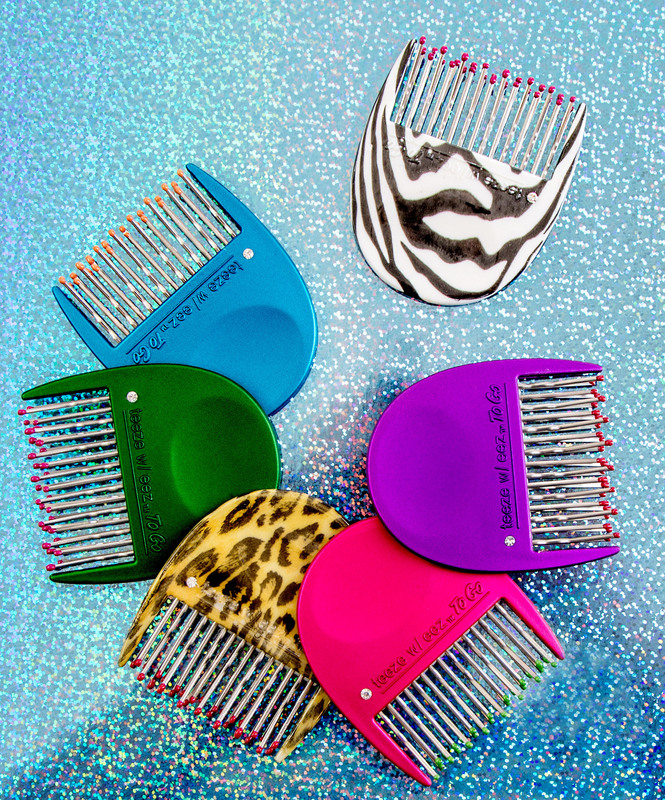 First, here’s the low down on Teeze W/ Eez teasing combs…they are lightweight and easy to hold on to. They are anti-static (bonus in the winter), and have a stainless steel pin design. The pins are gentle on the hair strands and won’t cause any breakage. 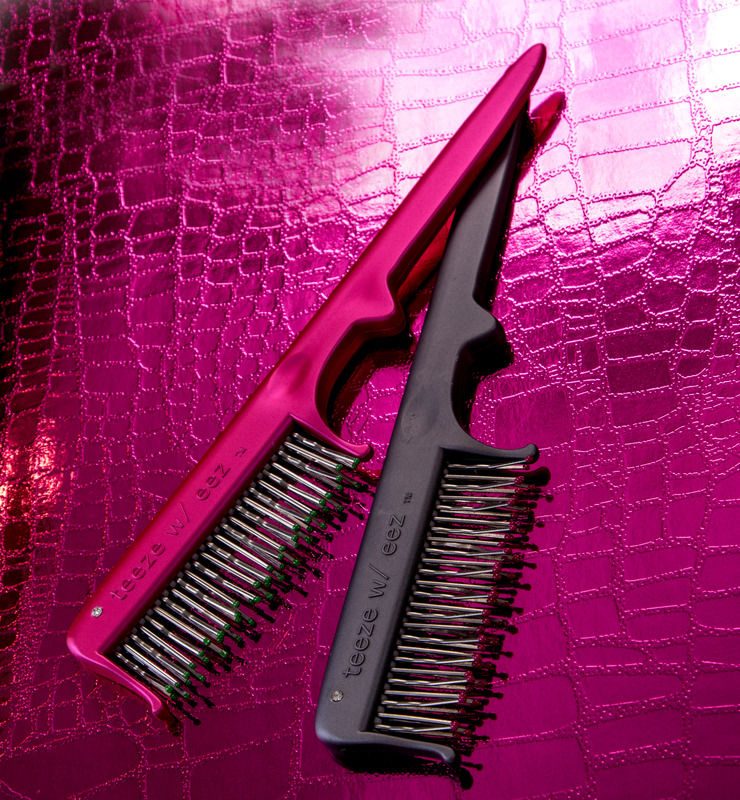 The Teeze W/ Eez Tease and Back Combing Tool is your more typical design. It’s simple to use and the end can help to section off your hair. I like to use it to create some oomph to the top, kind of towards the back half of my head. I take some pieces and lightly comb down to the roots. (And, you really only need one or two strokes to achieve volume.) If I want a little more dramatic look, I’ll use a spritz of hairspray before teasing which adds more hold. Then, I run my fingers through the teased section to smooth it out. You can do it all over, but I usually just stick to the top. I also love the Teeze W/ Eez To Go Little Tease Compact Styler. I keep one in my handbag at all times. It’s perfect for touch-ups when I’m out and about or my hair falls flat. I like to use it on the sides to fluff up my style. Because it’s smaller, it’s super easy to use all over. So, are you a “teeze”? I am! It’s time to step up your hairstyle with Teez W/ Eez. This entry was posted in Beauty Tips, beauty tools, combs, hair tools and tagged hair combs, hairstyles, teasers, teasing combs. Bookmark the permalink.